Three down, 9 million more to go. Not really, but it sure seems this way. Take a look at the one in the upper left - what was I thinking? I'll use it, but... umm... yuck. The one on the upper right is a garter stitch entrelac. What's the point of this? Entrelac is supremely annoying to do, whether you knit backwards or not, but the payoff is that you get that wonderful woven appearance, right? In this garter stich variation, there is no woven appearance possible as it is completely flat, so this means that you get all of the annoyance of knitting entrelac with none of the payoff. Plus, as you can see, I lost count of my rows quite often - yes, counting to "6" really throws me at times - and my tension is not regular at all, so basically, the whole block stinks. I like the one on the bottom, though. I left my chopstick circulars in place so that you can see how handy is is to have then ready to pick up that side and resume knitting. 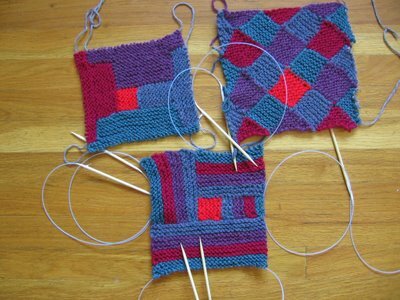 I'll continue in this pattern for another round, and see how it turns out. Then, I'll thread it onto a length of yarn for washing and blocking while I continue to try to figure out some clever way of hitching these blocks together. Please show us how you wrapped the book...step by step...PLEASE!!! The Red Roving is spun! All of it!